, a learned Prussian divine, was born at Geneva in 1696, took orders in 1722, and in 1724 was promoted to the church of Werder in Berlin. 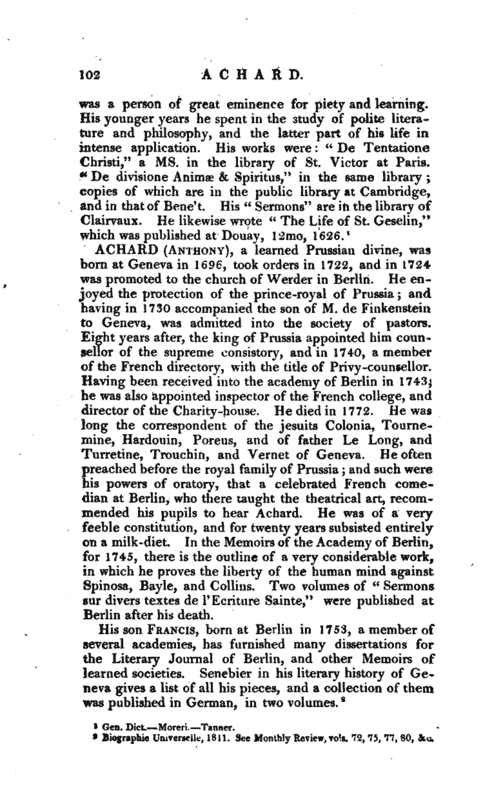 He enjoyed the protection of the prince-royal of Prussia; and having in 1730 accompanied the son of M. de Finkenstein to Geneva, was admitted into the society of pastors. Eight years after, the king of Prussia appointed him counsellor of the supreme consistory, and in 1740, a member of the French directory, with the title of Privy-counsellor. Having been received into the academy of Berlin in 1743, he was also appointed inspector of the French college, and director of the Charity-house. He died in 1772. He was long the correspondent of the Jesuits Colonia, Tournemine, Hardouin, Poreus, and of father Le Long, and Turretine, Trouchin, and Vernet of Geneva. He often preached before the royal family of Prussia; and such were his powers of oratory, that a celebrated French comedian at Berlin, who there taught the theatrical art, recommended his pupils to hear Achard. He was of a very feeble constitution, and for twenty years subsisted entirely on a milk-diet. In the Memoirs of the Academy of Berlin, for 1745, there is the outline of a very considerable work, in which he proves the liberty of the human mind against Spinosa, Bayle, and Collins. Two volumes of “Sermons sur divers textes de l’Ecriture Sainte,” were published at Berlin after his death. 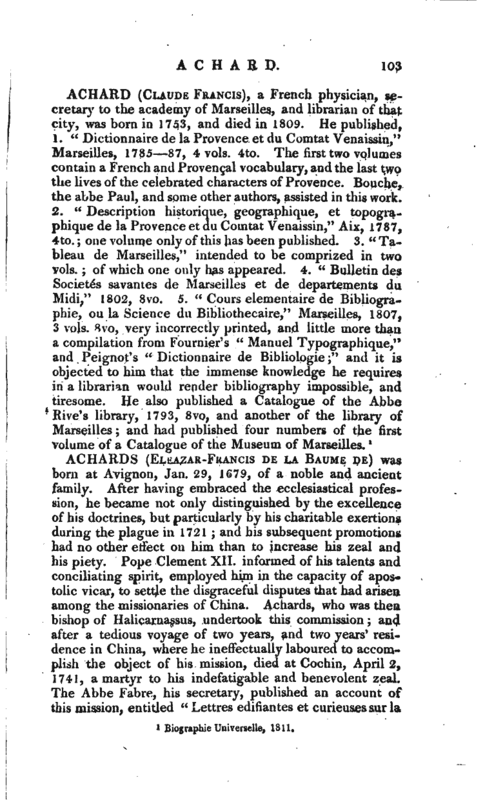 Biographie Umverselle, 1811. See Monthly Review, vols. 72, 75, 77, 80, &c.